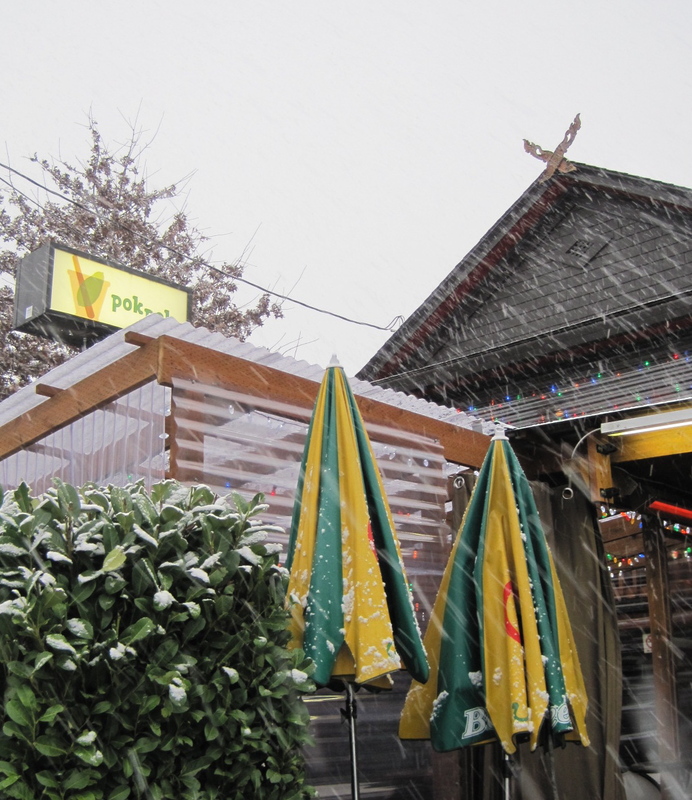 We were caught in the blizzard of the year yesterday in Portland. 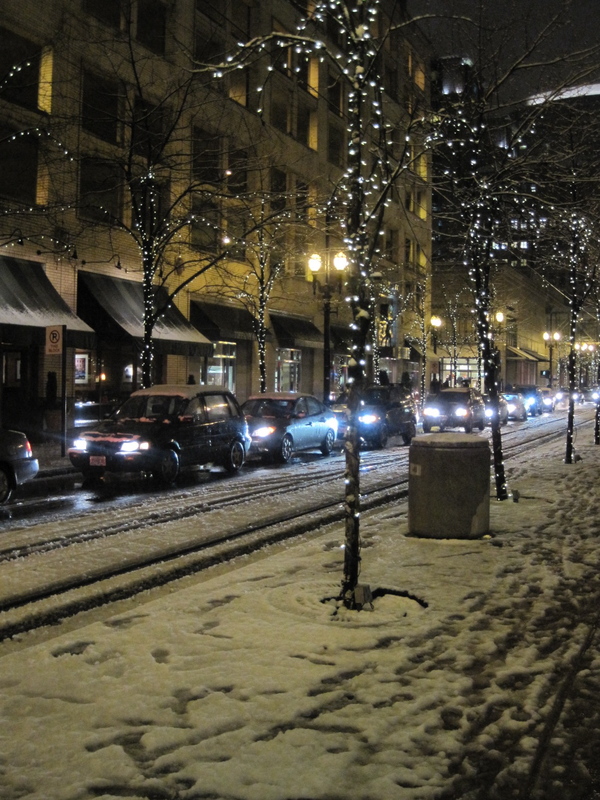 Eugene didn’t see one frozen crystal, but PDX got hit hard. I guess we picked the wrong day to go shopping, but is there ever a wrong day in the City of Roses? 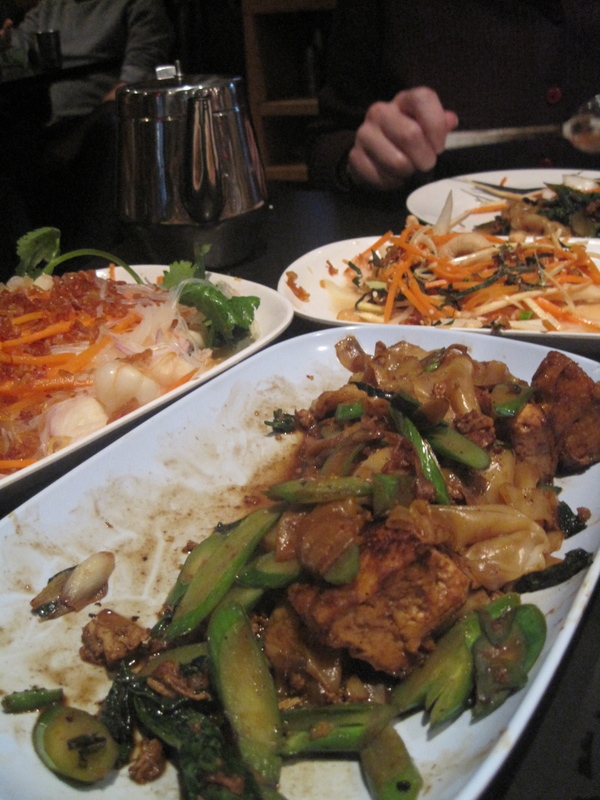 At Pok Pok, we ate sour, becarrotted glass noodles (see above); bitter-green, molasses soy-laced, tofu’d up pad see euw; and an amazing Northern Thai parsnip and carrot herb salad, and then mushed our way downtown and bought so many sweaters that our appetites were revived for drinks and dinner at Clyde Common. You MUST try the Bittersweet Symphony cocktail (Martin Miller gin, Aperol, Punt e Mes) if you go. And the escarole Caesar-style salad with baguette and a lemony anchovy-garlic dressing was surely a highlight of an evening of wonderful things. 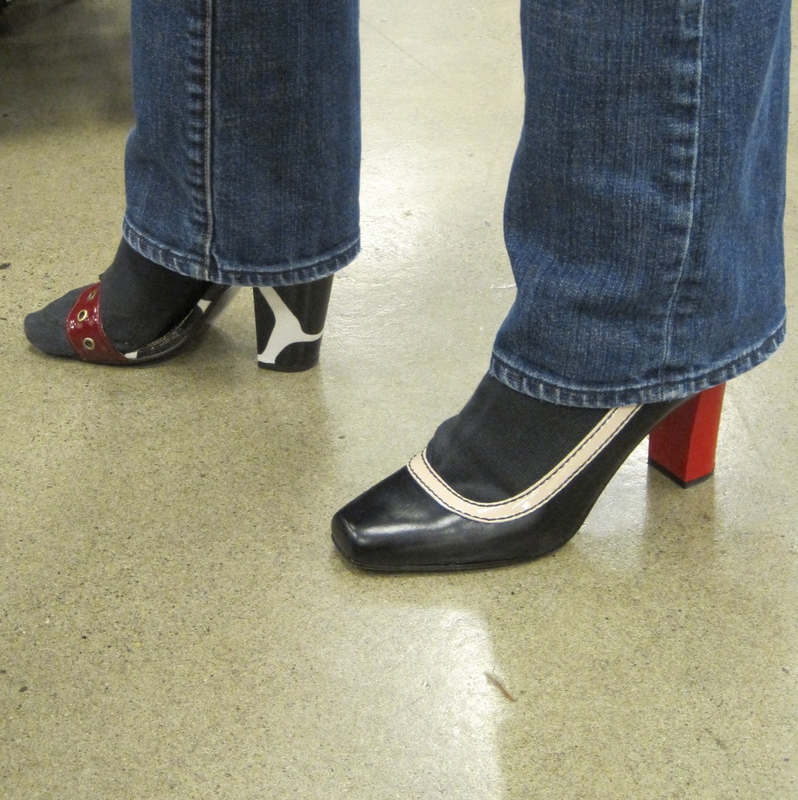 Didn’t have as much luck with the shoes, though. Keeping with the soupy theme of my Dark Days weekly local food posts, I thought I’d show off my adaptation of Maryland crab soup, one of my Baltimorean husband’s favorite treats. We used the leftover crab from our dungeness crab feast on Christmas to make a spicy, tomato-based soup. I have to say I’m not a fan of the ice-cold pre-cracked crab they think everyone wants here in Oregon. I was a bit annoyed on Christmas Eve when I opened up my sack from Fisherman’s Market and found my crabs cracked and cleaned, the top shells gone. Note to self: always check bag, especially during holiday busy times. I was planning to heat them up, crack them open at the table, and enjoy the slightly briny, slightly bitter mustard goop with Old Bay spice…in true Maryland fashion. But instead, the crabs were opened, scraped free of mustard, and doused in ice, which makes the meat soggy and dilutes the flavor. Grrrr. Regardless, the crab meat was still delicious. I hear and can attest to the news that the dungeness crab season has been an excellent one, so if you’re near Oregon, run, don’t walk, to your nearest fish market. 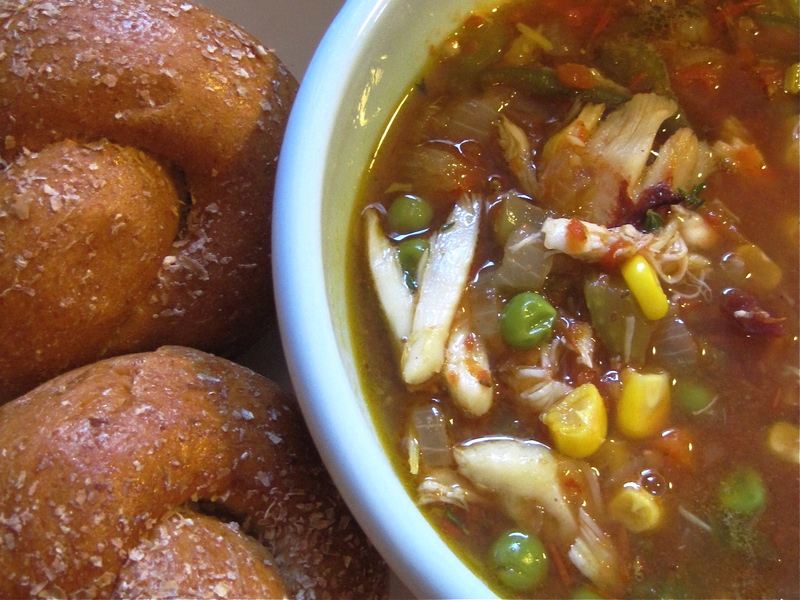 Maryland crab soup has as many variations as any authentic local recipe. I rarely meet one I don’t like. It’s a great day-after-crab-boil meal with the leftover crab. My Oregon version is a combination of painstakingly homemade and convenience foods, and it’s 100% Oregonian. Adapt as you see fit! But if you plan to use the top shells of the crabs to enrich your beef stock, watch your fish market salesperson like a hawk. Or a seagull. Or something. I still have a few stalks of local celery from a couple of weeks ago, thank goodness, since celery is crucial for the soup. I should have added a local potato, since potatoes are delicious with the spice mix from Maryland called Old Bay that’s so important for the soup, but I was in a hurry and didn’t want to wait. I did use my homemade celery salt (made with local celeriac) instead of my usual kosher flake salt, and it added a wonderful low celery base note. Lima beans are often used in this soup, but we don’t grow them that much here, and I didn’t want to rely on non-local limas. Frozen vegetables were going to be necessary, so I used frozen Stahlbush Island Classic Mixed Vegetables, our Willamette Valley purveyor of frozen organic local fruits and veggies. The green beans were dried by me last summer, and briefly reconstituted in hot water before adding them to the stock. The onions were from the larder and my frozen tomato sauce was added to provide tomatoey goodness. The beef marrow bones I used to make the stock were from Market of Choice, and I’m just going to hope they were local. The bacon was from Sweet Briar Farm. As for the Old Bay seasoning, this Baltimorean spice mix is found at fish markets and premium grocery stores, and it doesn’t really have a substitute. I was going to try to make a slightly more local version with leaves from my bay bush, but felt too lazy. If you’d like to give it a go, here is the recipe I was planning to make. Of all the recipes I perused, it looked like it had the greatest chance of having similar proportions to the original. Makes four portions. Does not keep well past a day or so. Prepare the soup base: sauté the onion in some bacon fat or butter. Add the bacon pieces. Pour in the beef stock and bring to a simmer. Add the crab shells, tomatoes, Old Bay, and bay leaf. Let simmer for 20-30 minutes to meld the flavors as you are preparing the fresh crab meat and vegetables. Remove crab meat from its crustacian home and chop vegetables. If you are using frozen vegetables, measure them out. Home-dried vegetables will also work. Reconstitute them at this point with hot water. Add mixed vegetables, green beans, and potato dice to soup. Cook for another 1o-15 minutes to soften vegetables, then remove crab shells and add crab meat just before serving. 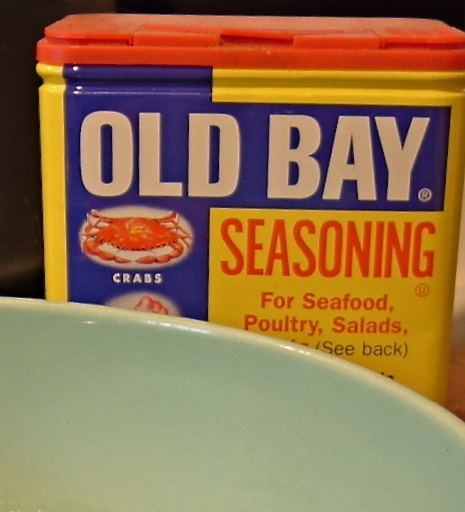 Adjust for taste, adding more Old Bay for spiciness, and salt and freshly ground pepper as needed. Be careful with the Old Bay, as it has salt in the mix. Serve immediately. …is not that big a deal. We don’t have kids and love spending time at home, relaxing, for the holiday instead of driving anywhere or partaking in frenetic family celebrations. And I take it a step further, almost borderline Scrooge-like by not wanting to spend hours in the kitchen. I rarely cook anything complicated, and we make it a rule not to have guests. New Year’s will bring Japanese ozoni rice cake soup, and I’ll be busy preparing my spiced pork, almond, and golden raisin tamales. But Christmas, Christmas is for relaxing. Instead of a roast or fondue, as we’ve done in the past, we’re planning to have plump dungeness crabs, preceded by oysters and some gorgeous imported cheeses and local bread. I flirted with the idea of boeuf à la ficelle, a tenderloin or similar cut that’s been tied and poached in a rich stock, but even that seemed like too much work. OK, I did make stock today — chicken and beef — and finally decorated the cookies. For my standard iced sugar cookies, I tried out a recipe in one of the cookbooks I recently reviewed for the Eugene Weekly: The Grand Central Baking Book. It was the Classic Buttery Shortbread recipe, but adapted for rolled sugar cookies. I really like the way this cookbook integrates preparation tips and possibilities for variation. (These things are a boon for a (still) beginner baker like me.) The recipe includes several pages of a “workshop” on how to assemble the cookies and icing, complete with a chart for 1.5 lbs., 2.25 lbs, and 3 lbs. of dough. I have to admit that the dough was crumbly and difficult to work with — this could be a function of not knowing when to stop with my new stand mixer, or perhaps the recipe, which is designed to actually taste good (unlike most rolled Christmas sugar cookies.) But my grumbling about the dough was soon stifled by a mouth full of cookie. They were delicious. The royal icing recipe looked manageable, eschewing the blending that some recipes require, but I used my tried and true powdered-sugar-and-water icing, which is much thinner and undoubtedly less effective at keeping on all the glittery bits, but it makes the recipe more about the cooking than the icing. Merry, merry Christmas! Hope your holiday is stress-free and filled with delicious delights. Mix flour and salt in small bowl; whisk to combine. Cream the butter and sugar using your new stand mixer on medium high speed for 6 minutes or more – the mixture should be lighter in color and fluffy. The original says sugar should start to dissolve into butter, but I’m not sure what this means. Scrape bottom and sides of bowl a few times. Switch over to low speed. Add vanilla and flour mixture “until the dough begins to come together” (also a bit mysterious to me). Divide dough in two, flatten out into flat disks, then wrap each disk in plastic wrap. You may choose to freeze or refrigerate, or do one of each, at this point. It keeps in the refrigerator for a week or frozen for 6 months. Then you’re ready to roll. After at least two or three hours chilling in the refrigerator, remove dough and let warm on counter for about 30 minutes. You’re looking for cool and firm dough that is pliable. Add a bit (no more than a tablespoon) of flour to your workspace and rolling pin, then roll to an even thickness, as thinly as possible. Cut out cookies with similar-sized cookie cutters per batch, and place them on parchment-sheet covered cookie sheets. You can reuse the scraps, but I recommend chilling them first before re-using. As you finish cutting out cookies and filling cookie sheets, return sheets to refrigerator to chill for another 5-10 minutes. This makes for nice edges on your cookies. Cook until only very slightly golden on edges, about 10 minutes. Switch sweets from top to bottom after 5 minutes. No matter what you do, the cookies will cook a bit unevenly if the dough is of variable thickness and your cookies are made of different shapes. Allow cookies to cool completely before decorating. They harden as they cool. For icing, I just use a mixture of powdered sugar, a drop of peppermint oil, and water, which makes a thin, transparent gloss upon which I can embed colored sugar and crushed peppermint sticks. It’s more traditional to use royal icing, a thicker preparation made of egg white, powdered sugar, and lemon juice. I’m really into soup this year. 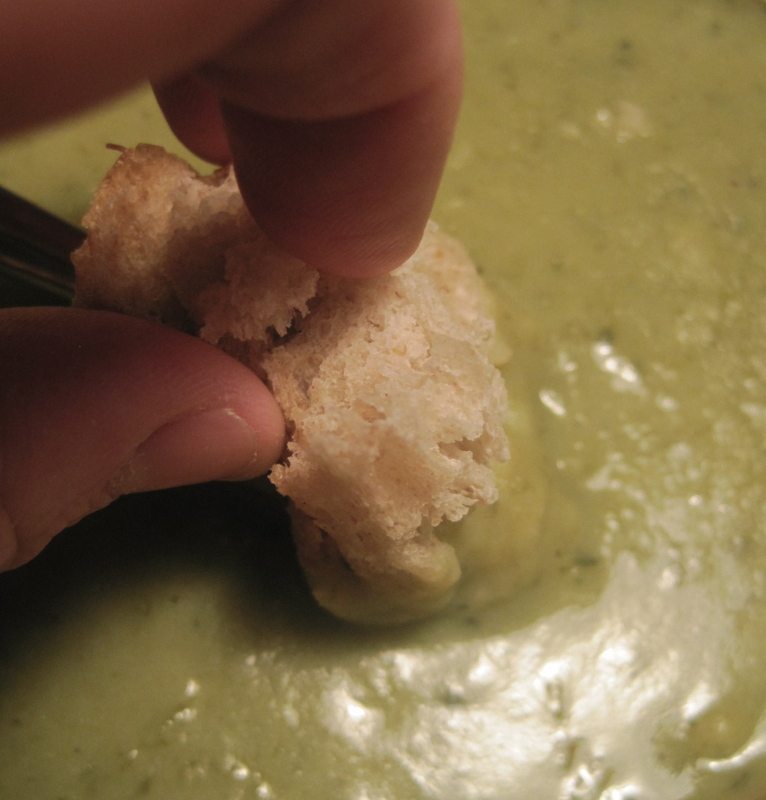 I fell off the soup bandwagon a couple of years ago during a manic soup episode because my husband decided that he no longer cared for soup. Heartbreaker. Ah, but this year, soup is his favorite thing, and my own soup nuttiness is also back. We’ve reached a synergy of soup. For winter soups, I rely on homemade chicken stock most of all, substituting it for water in most preparations, and beef stock in others. It’s what I have on hand, and it never fails me. But really, all you need is a big bag of dried mushrooms from an Asian market, or a bag of russet potatoes. Since I had an abundance of the latter, and a friend coming over for a quick dinner, I thought I’d make my Dark Days challenge for the week a local caldo verde soup, chock full of potatoes, leeks, and lacinato kale. The leeks and kale I had purchased as seconds the week before at River Bend Farm, and the potatoes were a mix of waxy and floury russet that I had bought from Groundwork Organics and another farm (Cinco Estrellas?) via Eugene Local Foods. I used up my German butterballs and red potatoes, and threw in some red garlic from Ayers Creek Farm for good measure. Potato soup relies on its own stock for a clean, potato-y flavor. I don’t even like to add onion when I’m making potato-leek soup, but since caldo verde soup, a Portuguese concoction involving potatoes and kale, needs punchier flavors, I tried to pump it up. Often, the soup contains smoky linguica sausage, but I wanted to keep it clean. I thought I’d sauté a half an onion with two fat leeks, a head of kale, and some garlic before adding the potatoes, a few fresh bay leaves, some winter savory (untouched by the freeze, btw), and heavily salted water. When the potatoes had cooked through, I adjusted the salt, added some white pepper and a splash of Datu Puti Spiced Vinegar (not even remotely local), and used my trusty immersion blender to purée it to a thick, delicious, pea-green soup. I added some Noris Dairy milk at the very end, just to thin it out a bit. Meanwhile, my friend had brought over popover batter made with local eggs, butter, and milk, and flour she had personally brought back from a trip to Butte Creek Mill in Oregon’s Rogue Valley. She gave the batter a final stir, and popped them in the oven to bake while the soup simmered and we snacked on my homemade vinegar pickles and pickled prunes thoughtfully left by a friend from Thanksgiving. Could it have been a nicer meal? I think not. 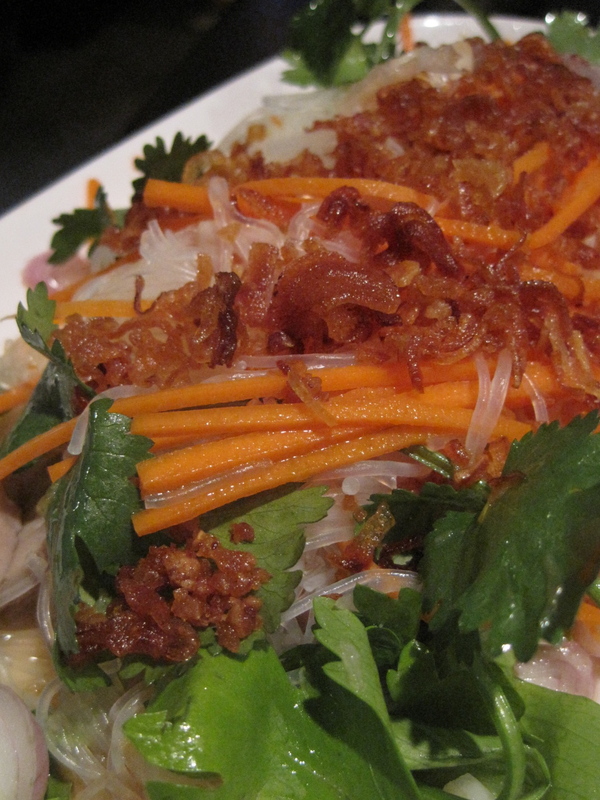 I count this as one of my happiest local cooking successes. This couldn’t be timed more poorly, with holiday baking and all, but it looks like salmonella was found at one of the shelling plants for Oregon’s hazelnut crop, in Newburg, OR. For more information, see the Oregon Department of Agriculture recall notice here. In a processing facility, where contaminated products are circulated and touched and redistributed, the possible contamination threat grows greater, of course. Salmonella is always a small threat — you probably have some in your refrigerator right now. At the very least, you needn’t fear your locally purchased nuts any more than you would any other crop, since vegetables, eggs, dairy, and everything else are always subject to salmonella. 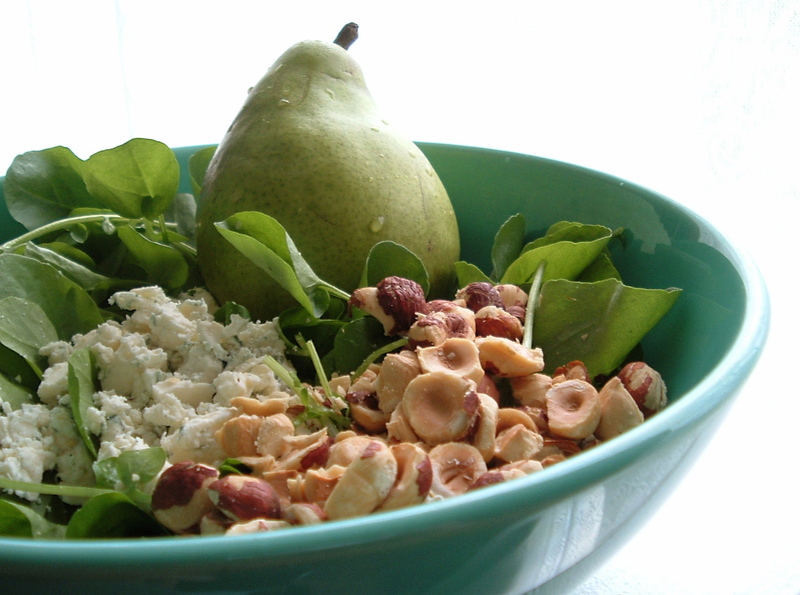 The salad depicted above, for example, could be laden with salmonella if an infected animal made its way through the arugula patch, or the pears were handled by a worker who didn’t wash his hands, or the blue cheese was crumbled by a chef who was careless about cross-contamination with raw meat on the kitchen counter. This recall is going to needlessly devastate sales of these nuts and local farmers dependent upon the income for the crop. It looks like the salmonella they found was localized to one place and caught at the distributor. The notice says that hazelnuts in the shell are still fine, even if you do buy them at a larger scale, but the vast majority of hazelnuts that are shelled are perfectly OK, too. If you bought your hazelnuts from small farms, such as Freddy Guys or Detering’s, or micro-networks, such as the farm stand at River Bend Farm that sells nuts from a local orchard, you needn’t fear purchases or throw away your nuts. One can also buy the highest quality plump, fresh, new-crop hazelnuts from middlemen like the OSU Extension-Lane County Master Food Preservers who accept nuts, shell and bag them, and sell them as fundraisers in the Willamette Valley. We still have bags left! Hazelnuts AND walnuts AND almonds, oh my — all from the 2009 crop and lovingly hand-shelled by our volunteers. The quality is better than anything I’ve ever seen. I would strongly encourage it, and not just because I’m interested in keeping Extension programs alive by any means necessary (and by the way, one of the services the MFP program provides is answering questions from the community about food safety recalls like this one). So…if you are local and suddenly in need of hazelnuts because of the recall OR you have questions about nuts you have purchased, please call the MFP hotline and leave a message at 541-682-4246, or drop by the OSU Extension office next to the Fairgrounds (950 W. 13th, Eugene) on weekdays (M-Th, 10-1, 2-5). Support your local hazelnut farmers — this is going to hurt in a year defined by hurt. The Adaptable Feast: Satisfying Meals for the Vegetarians, Vegans, and Omnivores at Your Table and The Farm to Table Cookbook: The Art of Eating Locally by Ivy Manning. Vitaly Paley commented that he found Oregon similar to France, respecting and sustaining local products and traditional methods. I couldn’t agree more, especially after reading these beautiful books. I’ll admit that I’m a cookbook junkie, and will read them cover to cover like novels. In fact, I probably read cookbooks more than any other book. But it’s been many years since I’ve seriously considered American cookery. I’m drawn more to ethnic cookbooks, just because I need more help with the ingredients and methods. These cookbooks made me change my mind. Ouch, I was seriously bitten by the cookbook bug. I’d love to do more reviewing in the future — publishers, authors, readers, got anything in mind that MUST be reviewed for 2010? I can’t make any promises, of course, but I’m interested in hearing from you. Check out Tami Parr’s cheese blog or Ivy Manning’s cooking blog if you like the style and theme of their books. I’m new to Ivy’s blog, but have been reading Tami’s for quite some time for PNW cheese events and reviews. Right now, she’s featuring a compelling selection of cheeses for holiday giving. I’m sad that my copies of the fabulous The Joy of Pickling (rev. ed.) and The Joy of Jams, Jellies and Preserves arrived too late to be included in the EW review, but I plan to make amends. :) In the meantime, check out author Linda Ziedrich’s preservation blog and browse these lovely cookbooks at your nearest bookstore. They’re a wonderful addition to the Ball Blue Book preservation repertoire, which is great but rather old-fashioned. Ziedrich stresses food safety (with some exceptions) much more than the French preservation cookbooks with unusual recipes, and she also includes many international recipes from the Middle East and Asia, so you’ll find many unique recipes. And her PNW cred is impeccable — it was so nice to see a recipe for home-grown medlar jam, for example, and a meditation on particular fruit varieties that are cultivated in Oregon. Technically, The Paley’s Place Cookbook came out in late 2008, and The Farm to Table Cookbook came out a bit earlier, but who’s counting? Each of these cookbooks had its inspirations, and testing recipes even provided me with a chance to play with my new KitchenAid mixer. 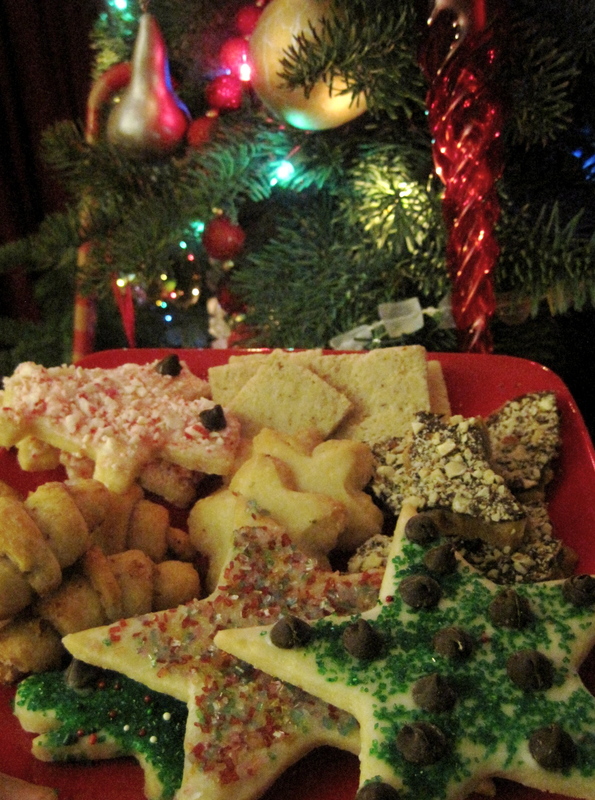 Speaking of which, if you’ll excuse me, I’ve got my own procrastinating to address…cookies, cards and presents, oh my! Grading’s done, yay! So now it’s time for the honored yearly holiday tradition, celebrated by academics worldwide…the Writing of the Research Papers. I’ve got three big projects to wrestle down into various marketable forms by the beginning of January, plus some other stuff farther along in the process. I now see the meaning of the phrase ‘piled higher and deeper,’ sigh. But who can complain, when the world brings you fresh kimchi, made to the exacting standards of a restaurateur who wants to control what goes into her pickled radish? As I ate a bowl of steaming, egg-laden short rib soup with glass noodles at Café Arirang yesterday, the chef-owner explained her standards, and her process, to me. She uses a bit of sugar and no pickled fish sauce (for American tastes, she said; I’m an American and I like it, I protested). 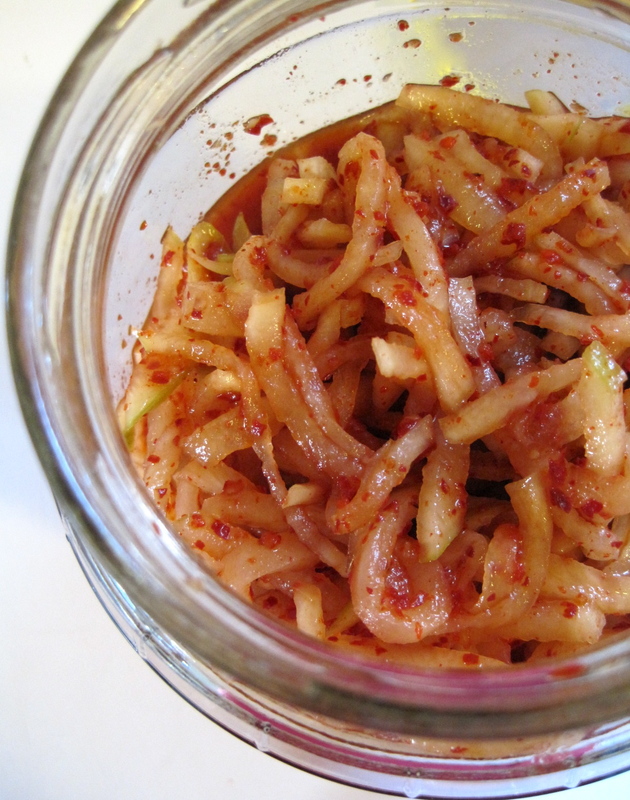 Her method makes for a particularly fragrant, sweet-sour, crunchy spicy pickle. She was willing to sell me a quart container brimming with radish kimchi for $10. She might be willing to sell some radish or regular cabbage kimchi to you, too, if you ask.